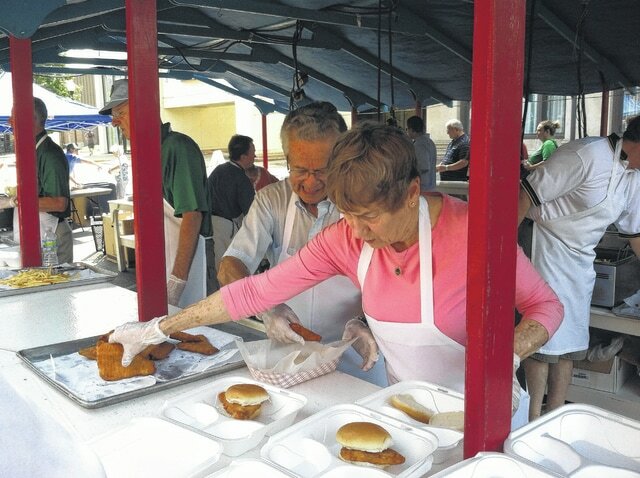 Common file photo On Friday, September 4, the Rotary Club of Portsmouth will have their annual fish fry on the Roy Rogers Esplanade from 10 a.m. – 7 p.m. Tickets are $6 and can be purchased at the event or from any Rotary Club of Portsmouth member. The 2015 River Days Festival is set to take place September 3-7 in downtown Portsmouth. The festival schedule has been filled with activities for the entire family. On Thursday, September 3 the opening of the festival will take place at 5 p.m. on the river front stage, with contestants for the 2015 Miss River Days Pageant introduced at 5:30 p.m.
Local singer and song writer Steve Free will take to the river front stage at 6 p.m. with Josh Stewart performing at 7:30 p.m. The evenings featured entertainment is Phil Dirt and the Dozers performing at 9 p.m. Festival officials say the band was brought back by popular demand. On Friday, September 4, the Rotary Club of Portsmouth will have their annual fish fry on the Roy Rogers Esplanade from 10 a.m. – 7 p.m. Tickets are $6 and can be purchased at the event or from any Rotary Club of Portsmouth member. The festival midway and marketplace craft area will open at 5 p.m. The group Southern Edge will take to the river front stage at 7:30 p.m. The evenings featured entertainment Keith Anderson will take the stage at 9 p.m. In addition to his own musical career, Anderson co-wrote the Grammy-nominated, “Beer Run (B Double E Double Are You In? )” for Garth Brooks and George Jones, “The Bed” for Gretchen Wilson and “Barn Burner” for Jason Michael Carroll. On Saturday, September 5 the festival midway and marketplace craft area opens at 10 a.m. Children’s activities for Saturday, September 5 will take place in York Park starting with 11 a.m. with an expanded petting zoo and pony rides. Also at 11 a.m. will be Jess Moore and Louie the monkey. From 3 p.m. – 6 p.m. COSI on Wheels will visit York Park. At 6 p.m. registration starts for Buckeye Sanctioned Kiddle Tractor Pulls with pulls to begin at 7 p.m. The River Days Grand Parade will start at 11 a.m. Serving as parade grand marshal will be David Pettit, Ohio State Drum Major. The annual Miss River Days Queens Pageant will take place in the Vern Riffe Center For the Arts on the campus of Shawnee State University, starting at 5:30 p.m. Terry Hall and The Dave Morrison Band will take to the river front stage at 7:30 p.m. The evening’s entertainment Sawyer Brown will perform at 9 p.m.
On Sunday, September 6 the festival, midway and marketplace craft area opens at 10 a.m. In York Park at noon there will be a petting zoo, Jess Moore and Louie the Monkey along with the OSU Buckeye Mobile Tour will take place. At 6 p.m. the group FLINT will take to the river front stage, the group TEAZER will perform at 7:30 p.m.
Doc Rock and The Remedies will perform at 9 p.m. followed by the festival fireworks extravaganza at 10 p.m.
From 9 a.m. – 4 p.m. on Monday, September 7 will be an antique and collector car show in Bonneyfiddle. According to festival officials the rides will be placed along Front Street. All concerts are free and will be on the river front stage at Court Street Landing in Portsmouth. For more information about the annual River Days Festival visit them at www.portsmouthriverdays.org or on Facebook.